"A hearty dinner, great with rice! It is one of family's favorite dinners given to me by my sister. You may adjust amounts of beans and salsa to your preference. I always seem to add more!" Season pork chops with pepper. Heat oil in a large skillet over medium-high heat. Cook pork chops in hot oil until browned, 3 to 5 minutes per side. Pour beans and salsa over pork chops and season with cilantro. Bring to a boil, reduce heat to medium-low, cover the skillet, and simmer until pork chops are cooked no longer pink in the center, 20 to 35 minutes. An instant-read thermometer inserted into the center should read 145 degrees F (63 degrees C). Loved this meal. It was delicious. 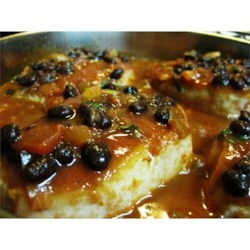 I put it in the crock pot, porkchops uncooked, cilantro on top, salsa, black beans. Cooked on high for 3 hours. Pork chops falling apart,so tender, so good. Plate licking good! I seasoned my pork with some chili powder, garlic, season salt, and onion powder. I also served mine over rice. I will definitely make this again! Wonderful recipe! I followed the advice of another reviewer and cooked mine in the crock pot and also used chili powder, cumin, seasoning salt, garlic powder, and onion powder.